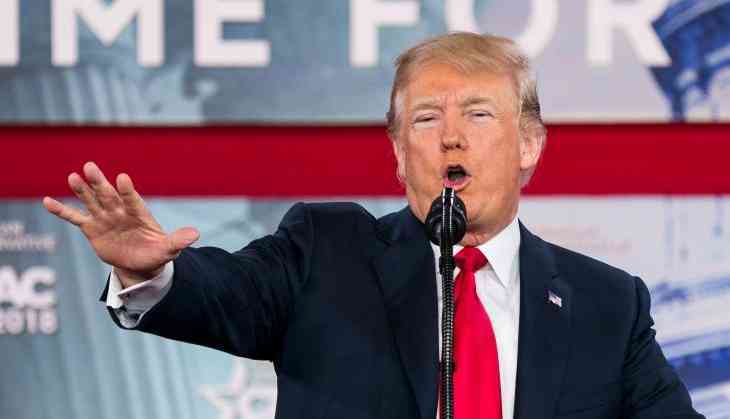 The US President Donald Trump said American media was "dying to see" him make mistake, as he continued his public criticism of the press a day after the White House barred a reporter from attending one of his events. "Look at all those cameras. All those cameras, every stop I get all these cameras. This never happened to (former president Barack) Obama. This never happened to (George W.) Bush. This didn't happen," Trump told his supporters in Iowa yesterday, referring to the camera journalists present at the event. "They just follow. They're dying to see us make a little bit of a mistake," he said. His criticism came a day after the White House barred a CNN reporter from attending a presidential event, arguing that it expects "everyone to be respectful of the presidency." The decision invited strong protests from journalists. The White House Correspondents Association condemned the "misguided and inappropriate decision" to bar the reporter from attending a Rose Garden event after she shouted a question at Trump during an Oval Office media availability. Today, Trump said the news media analyzes his every word. "They say, did he say that? Could it have been?" he said. The news media, he said, follows him "like never before". Trump urged his supporters to spread the word about the good work he is doing. "The good news is: we can get the word out... And the word that I get out is what's happened to steel in this country over the last six months," he said, making a case for his steel and aluminum tariffs, that they are helping US workers. "Even though we've been here for a little more than a year and a half, but we really hit it big over the last six months with what we've done," Trump said. Trump's run-ins with the American media began soon after his presidency began in January last year. He has previously accused the media of spreading "fake news" and for closely scrutinising his statements and stance towards Russia. He has often taken a more direct rote to communicate and get his message across to his followers, using the social networking service Twitter.